Nelson police noticed a decline in Shambhala-related calls for service in August, and thanks a private security firm for taking some pressure off local officers. The 15th annual music festival was at Salmo River Ranch from August 9 to 13 with 10,000 tickets sold and an additional 1,000 volunteers and staff working on the site. In previous years, police responded to numerous calls about unwanted campers on private property, particularly at the Nelson Landing site near Red Sands Beach, before and after the festival. But this year, officers didn't respond to a single call from that area, because personnel from Mountain Eagle Security were monitoring the area instead. "Their efforts freed up [Nelson Police] for other priorities," Chief Wayne Holland said. Prior to Shambhala, the security guards removed 37 squatters near Nelson Landing, 26 of who said they were planning to attend the festival. The others were fruit pickers or other transients. After the festival, another 57 people were evicted from the property and all but 10 of them had been at Shambhala. During the month of August—the month Nelson is most affected by the festival—police make a habit of asking people they deal with whether they are in the area for Shambhala. Officers began recording their findings last year. Between this year and last, there was a noticeable decline in Shambhala-related incidents. During the first 2 weeks of the month, August 1 to 16, only 5% of all calls involved Shambhala-goers, compared to 16% in the same period last year. This year police responded to the most disturbances from people going to the festival in the 4 days prior to the event, while during and after the festival there were fewer concerns. Conversely, last year Shambhala-related calls were high before the festival, then increased further during the event and spiked most dramatically in the 4 days after. Asides from help from Mountain Eagle Security, Holland also speculated that Shambhala-related calls decreased this year because the demographic of people attending the festival is changing, as its popularity attracts people with more money to spend. "More affluent ticket purchasers are better able to provide for themselves as far as accommodation and transportation pre- and post-event," Holland suggested. He also said the fact that Shambhala allows festival goers to stay on site before and after the main music events has reduced the number festival goes camping in Nelson while also allowing concert goers to rest and detoxify after the event. Mountain Eagle Security visited with many local businesses today at The Prestige Rocky Mountain Resort and Convention Centre to show our support for local businesses and to strive to make our company even better for our clients. Mountain Eagle Security is now on Twitter! 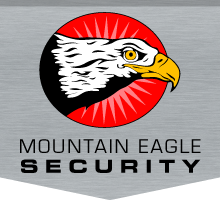  Mountain Eagle Security is now on Twitter! Follow @Mescran for Twitter updates. Mountain Eagle Security is now on Facebook!  Mountain Eagle Security is now on Facebook! Are you looking to get security for your property? Contact us today.